During the study period, 51 (32%) patients received TEA, 79 (49%) received ITM plus PCA opiate, and 31 (19%) received PCA alone. The incidence of postoperative hypotension was significantly higher in those who received TEA compared with those who received ITM (21/51 (41%) vs. 7/79 (9%), P < 0.001). 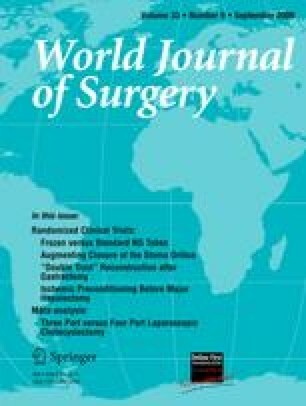 The median (range) perioperative IVF administration was higher in the TEA group compared with the ITM group for both the first 24 h (6 (3–11) liters vs. 5 (3–11) liters, P < 0.05) and in total (15.5 (5–48.5) liters vs. 9 (3–70) liters, P < 0.001). Respiratory complications occurred in five (10%) of the TEA group compared with one (1%) in the ITM group (P < 0.05). The median (range) hospital stay was longer in the TEA group compared with the ITM group (9 (3–36) days vs. 7 (3–55) days, P < 0.01).